When I first heard about the J.P. Morgan Palladium card, my emotions took over and I immediately knew that I had to get my hands on it. This is a brand new credit card that first came out in 2011. This is a card that is constructed out of the precious Palladium metal, laser etched with 23K gold, and has your signature laser engraved into the back of the card, with smart chip and signature technology. This is a card that weighs a heavy one ounce, reportedly worth approximately $1,000 in the high end materials used to produce the card itself. One article reported that card membership required a private banking relationship with J.P. Morgan, in which the average account holder has around $30 million (that's $30,000,000.00) in assets held in the bank. When I first heard a few reports of "normal" consumers applying and getting approved for the card, I knew I had to try. I definitely do not have $30 million in my bank account (yet) but I know that my credit score and history is awesome. I heard mixed reports that the Palladium card may be easier to obtain now, while the requirements for becoming a card member are not as strict. I'm sure you've heard of the American Express Centurion Card (also known as the AMEX Black card), the most exclusive, high end credit card of all time. When the AMEX Black card first came out, they opened up invitations to anyone. Later, to make the card ownership more exclusive, they stopped open applications completely and limited card membership only for special AMEX personal invitations. Currently, they've stopped giving out invitation for the AMEX Black Card. I decided to apply for the Palladium card, while I still had a chance. 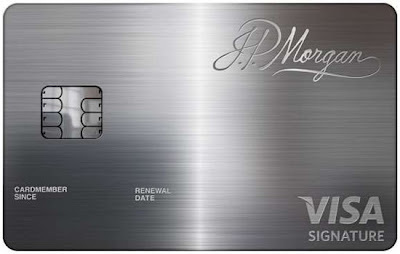 You cannot simply apply for the J.P. Morgan Palladium card online, like most credit cards. If you look on the Chase banking website, the details for card application are very slim. All it says is to call an 800 number to speak with a banker for details. Before calling J.P. Morgan, I made sure to pull as much detail about my credit report and credit score to make sure everything was pristine. Then I nervously called the 800 number, chatted with the nice representative for a few minutes, and then I was emailed a copy of the Palladium card application. It is a pretty basic credit card application, requesting details about my finances such as my mortgage, annual income, and whether I had any previous banking history with Chase (checkings, savings). The difference between this credit card application and previous ones was that this application included a signature box for me to sign and fax in. The signature box is used to have the cardholder's signature laser etched into the back of the card. I've never been denied any credit before, but applying for this card definitely made me nervous and anxious. I received a phone call the next day from a banking rep asking why I currently have so many Chase cards (I currently have 3 other Chase credit cards). I explained that I am a big fan of Chase, and that I frequently use every Chase card I own. He also asked me why I wanted this card. I enthusiastically explained that I wanted all the benefits that this card had to offer, and that it was either I apply for "this card, or the comparable American Express card." The rep asked me if it was all right for me to lower some of the limits on my other card to apply to my new card. I said "no problem!" and was thrilled, because that meant that I was approved for the card! The rep then told me that they needed to construct my credit card and have it shipped to me via UPS next day air. I came home to a heavy black box at my doorstep. Inside was a fantastic presentation of my new card, held inside thick brown felt, the kind of box used to hold fancy jewelry. The package also included a nice 57 page benefits, services, and rewards guide. 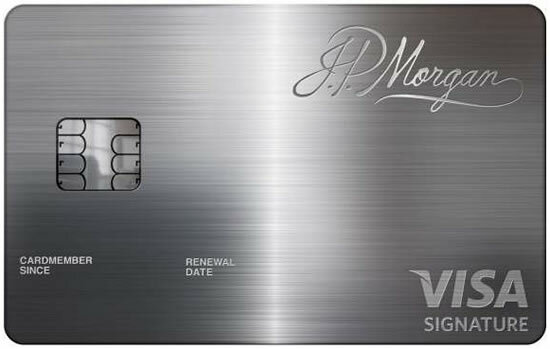 J.P. Morgan introduces the program to you by saying it is their pleasure to "welcome you to one of the most desirable and most exclusive credit card programs in the world." Personal concierge service is able to provide you with "virtually limitless array of unique offers, time-saving conveniences and personalized insider expertise." Available 24/7, the concierge can assist with information and reservations for airlines, hotels, car rentals and cruises, as well as personal assistance with dinner reservations at exclusive restaurants, ticket procurement for sold out concerts and shows, and transportation needs. - 35,000 bonus points once you spend $100,000 annually. The Palladium card includes Priority Pass executive lounge access at over 600 airport lounges in major airports worldwide from "Atlanta to Zurich." Priority Pass membership is complimentary for you and a guest, regardless of which class or airline you fly. These premium lounges include all the amenities you could want when waiting for your next flight or layover. These amenities include: unlimited snacks, food, drinks, wifi, computer use, even showers! I looked up the value of Priority Pass for unlimited access to lounges and it is $399 annually with each additional guest fee of $27. Priority Pass is no longer a benefit of the Palladium card and has been replaced with Lounge Club membership, which provides airline lounge access at over 350 airport lounges in more than 200 major cities worldwide. Lounge Club facilities include a quiet and comfortable place to wait for flights, with complimentary refreshments, snacks, free wifi, free open bar, and more. I have tested the Lounge Club features and it seems like I can allow multiple guests inside a Lounge Club without issue. Last Lounge Club I visited, I was able to swipe 7 people in with me without incurring any extra fees. Your card includes a private aviation consultant. You are given one complimentary hour of flight time with purchase of a Marquis private Jet card (which starts off at $119,900 for 25 hours on a private jet. Value of one free hour of flight: $4,796. This is a feature I won't be needing anytime soon. By booking a hotel stay with your card, your benefits may include: complimentary meals, complimentary room upgrades, exclusive discounts, special gifts and amenities, as well as early check-in and late check-out. Automobile rental collision damage waiver up to cash value of the car (collision or theft). Emergency evacuation and transportation coverage up to $100,000 and travel accident insurance up to $1,000,000. Yes, that's 1 million in travel accident insurance for death or dismemberment (I hope I never need to redeem this insurance policy, but it's a great one to have). $2,500 emergency dental expenses covered. Trip cancellation / interruption insurance up to $5,000 in the event that a trip needs to be cancelled or interrupted. If your trip is delayed by more than 12 hours (or require an overnight stay), you are provided up to $300 per ticket for lodging and meals. If your baggage gets delayed by more than 18 hours, you are covered up to $500 for the emergency purchase of essential items. Hotel burglary insurance up to $1000 per trip for personal property stolen from your hotel or motel room. Imagine buying a new laptop and then accidentally dropping it the next day, shattering the screen. No problem. All of your purchases are protected up to $10,000 per claim, $50,000 per year in the event that something you buy results in theft or damage within 90 days of purchase. Not happy with a purchase and the merchant doesn't accept refunds? Palladium card will reimburse up to $500 per item, $1000 per year, even if the merchant refuses to accept a return. Most credit cards have this benefit. If you buy something and find an advertisement for the same product at a lower cost, price protection will refund the difference up to $500 per item, and $1500 per year. Ticket protection will reimburse you up to $500 per ticket, $2000 per event, and $4000 a year if you purchase non refundable concert, theater, or sporting event tickets and you are unable to attend. As with most credit cards, any purchase you make with your Palladium card automatically gets double the time period of the original manufacturer's written U.S. repair warranty up to one additional year. I've read user experience where they have received up to $5000 worth of gift cards annually as a benefit of card membership. It's not uncommon for premium credit cards to give their holders free gifts every year. I'm curious to see what I receive this year. - Request additional cards for authorized users for $99 each. This is a hot deal considering the value of the precious material used to make each metallic card. Other premium cards charge for authorized users as well. The AMEX Centurion card (Black Card) charges a whopping $1500 per authorized user. The Visa Black card charges $195 per authorized user. The AMEX Platinum card charges $175 for up to 3 authorized users. Me and the fiancé got to test out the lounge access today while we had a quick layover between flights. We briefly stopped by, loaded up on a bunch of free snacks and drinks, then got on our next flight. I never knew that you could take a shower in an airport! I can definitely see ourselves making use of airport lounge access for future flights. Going to the airport to check in early doesn't seem so bad. The annual fee for the Palladium card is a whopping $595 a year. Other premium cards have expensive annual fees as well: American Express Centurion card ($2,500 annual fee with $7,500 one time joining fee), American Express Platinum card ($450 annual fee), Visa Black Card ($495 annual fee). For certain spenders, this card is definitely worth it. I've read user reviews of the card saving over $600 on free hotel upgrades. Getting sold out tickets to a special concert can be priceless for some people. For frequent flyers that enjoy premium airport lounge access, this service is worth $399 annually. Let's say you rent a $30,000 vehicle and it gets totaled. The unbeatable included auto protection will cover this expenses. For now, this card is a keeper. If I find that I’m not getting the most out of these benefits in the future, I’ll cancel the card, or downgrade it. UPDATE: Just received my free United Airlines Lounge Club Membership. I simply called my Palladium concierge and kindly asked for free membership into the United Club. They processed my application and send me the card 3 weeks later. All I needed to do was give them my United MileagePlus Frequent Flyer number. The United Club amenities include complimentary bar service, beverages, light snacks, free Wi-Fi, complimentary fax machines and photocopy services, and current newspapers and magazines. As you can see, United Club membership is $475 a year, another perk of owning the Palladium card. I've updated some new changes and hidden benefits of the Palladium card in a more recent post. Now 1 year later, I have decided to say goodbye to my Palladium card. Thanks for posting about the card. Really interesting! Question, if you don't mind sharing how far away were you from the minimum thresholds they want like $30mm in bank etc? Hi Anonymous, I was pretty far away from the alleged $30 million requirement when I applied for and was approved for my Palladium card. When the Palladium first came out, it was limited to Chase Private Banking customers only. There was a short period of time between 2011 and 2012, when Chase allowed potential customers to call an 800 number and apply for the card directly. When I applied, I had between 0.5M to 1M in assets, with about 1/6 of that amount locked in retirement funds, some in cash, and most in real estate. I had less than 30K in my Chase bank account. Since then, the new unofficial policy seems to be that one needs to have a Chase Private Client (CPC) relationship in order to be able to apply for the Palladium card. Of course, credit score and annual income will come into play when applying for the card. Having a CPC relationship does not guarantee one will be approved for the Palladium card. To my understanding, the minimum amount necessary to open a CPC relationship is currently $250,000.